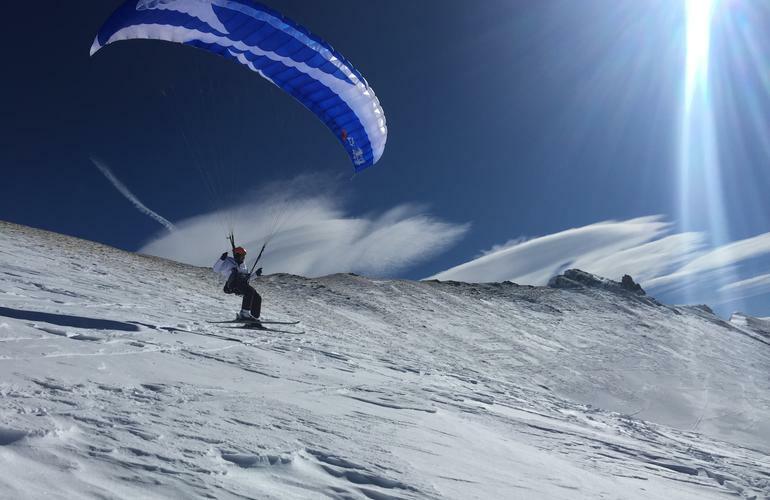 Speedriding – The perfect mix of Paragliding, Skiing and Adrenaline! There are very few sports that are practiced on several different elements at the same time. By combining an activity in the air and on the snow, Speedriding has become an original and extremely fun experience. With both a wing and skis, you can carve down the slopes and then take to the air when it suits you. Although it might seem similar, this sport is totally different from paragliding, the spirit of Speedriding is influenced by the speed and proximity to the ground beneath you. 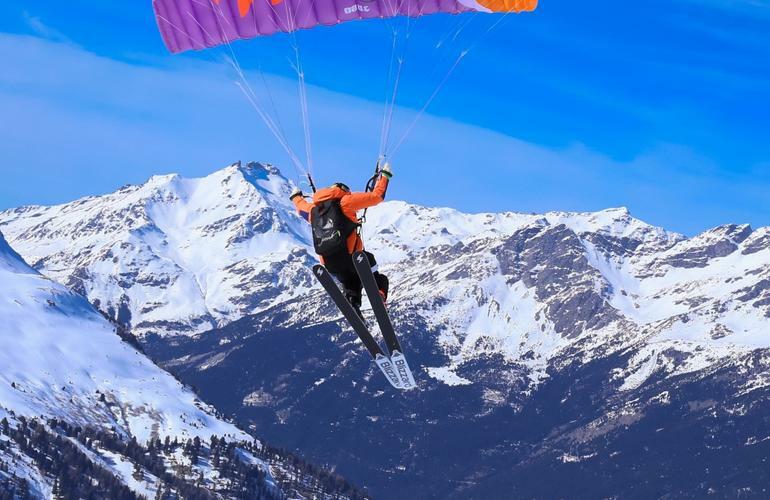 Between heaven and earth, Speedriding or Snowkiting (which is the equivalent but with a snowboard) is jam-packed full of reasons to motivate you to test these unusual high-flying activities. 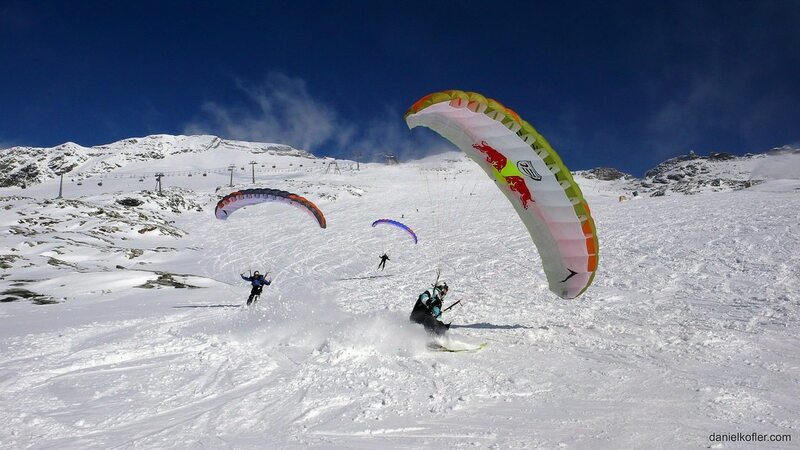 Speedriding is a form of winter sport paragliding but with a small surface wing. Take-off and landing are on snow-covered trails and is carried out with skis or a snowboard attached to your feet. The sails used have a surface area that varies between 8 to 12 m² which allow for alternating flight and riding sessions. One of the advantages of Speedriding is that it offers the possibility to ride in places that are generally not very accessible to skiing, thanks to the fact that you can fly over or around obstacles by taking to the skies. Note, however, that a confirmed level of skiing is mandatory because you’ll spend most of the session off-piste. You must have a ski level equivalent to the 3rd ESF star to take part in Speedriding. 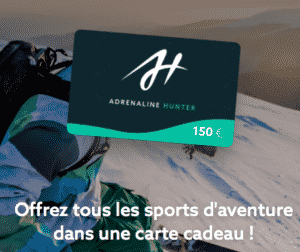 Born from the fusion of paragliding and off-piste skiing, Speedriding appeared in the early 2000s in France (Valfréjus). The objective is more to play with the relief of the slopes by mixing riding on snow and navigating in the air, rather than the more traditional long flight over the slopes. Not to be confused with Speedflying, which is the equivalent of Speedriding in theory as it’s a flight close to the ground but without skis and the rider does not touch the ground until the landing. Neither to be mixed with paragliding with skis, which consists to taking off and landing with skis on the snow, but all the rest happens in the air and especially not with wingsuit proximity flying, which involves brushing against rock faces while free-fall flying. Speedriding is already quite established in France, especially in Morzine (Portes du Soleil), Tignes or Val d’Isère with professional and experienced instructors who will give you all the basic tips to help you start. You can also try Speedriding in Spain, in the Natural Park of Posets-Maladeta and all over the world, as long as you have a mountain, snow and all the necessary equipment, which includes a small Speedriding wing/sail, a harness, a helmet and a pair of skis/snowboard. Wingsuit flying is finally accessible to all! TOP 10 Last Minute Activities to Give This Christmas! Give the gift of thrills this Christmas.